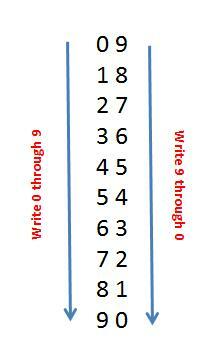 An easy way to write your 9 times table is to write 0 through 9 down the page. And then write 9 through 0 next to it. The tens digit of nine times something is something minus one! Then the tens digit and the unit digit add up to 9! Try it with 9x4. The tens digit is 4 minus 1 (which is 3). 3 plus ? equals 9 (? is 6).